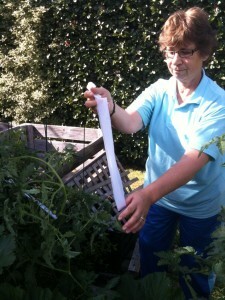 Hello, my name is Sally Ann, avid domestic gardener and founder of Gardening Australia Guide. I have been gardening now for over 50 years, and have been able to inspire my family to enjoy the pleasures of gardening too! Both my son and my husband have an active role in our family garden, and to a certain extent this website. For me, gardening started when I was very young. My father always had a garden, and would get me to help him with planting, pruning and other tasks. As a young girl, I must admit that there were times I didn’t enjoy these activities, and would much rather have been out playing with my friends! However, respect and knowing your place were important when I was growing up, so helping dad in the garden was just something that had to be done. We lived on a farm growing up, so getting to the local shops meant walking for miles. As such, my parents would only do grocery shopping once every three months, and for the rest of the time we were self-sufficient with our own produce – meat, milk and of course vegetables from our garden! I still remember my father saying to me that “having a vegetable garden on your own property is good for the family” and how true that statement really is. Since growing up and having my own family, I have always maintained my fathers idea of having your own vegetable garden. Although times have very much changed, and reliance on home grown vegetables is not quite as necessary as it was growing up, I’ve come to enjoy the experience and pleasure of gardening all the more – and the fruit and vegetables we reap are all the more reward! Of course, it’s true to state that the taste and freshness of your own garden fruits and vegetables can never be matched! When my father died some years ago, I lost interest in many things for a while – created distance from family and friends, and was very taken back. However, the one activity that brought me back from sadness was my gardening. I still continued to potter about the garden, digging garden beds, planting tomatoes and zuccinis the same way my father had taught me as a child. Gardening has been a large part of my life, and in many ways my saviour. There is always something to do in the garden no matter what the weather. If i’m not out tending to the vegetables, you’d no doubt find me pruning flowers, mowing, mulching and edging! I am in no way an expert gardener, but having grown my own plants and vegetables successfully for over 50 years, I certainly have some experience to offer others! It was my son who suggested putting this website together, in order to be able to share my gardening methods and passion with others. I truly hope you enjoy browsing through this website, and can gain benefit from the information, ideas, comments, and suggestions presented.